Say ‘buon giorno’ in Melbourne with a trip to Carlton, home to Little Italy and the birthplace of Melbourne’s famous café culture. But that’s not all there is to this exciting suburb – you can also expect to see some of Melbourne’s best attractions, examples of incredible architecture and a few of the city’s loveliest gardens. Our Carlton hotels will put you right in the thick of it! Carlton was founded in 1851 at the beginning of the Victorian Gold Rush, which attracted many immigrants from Italy. The Italians continued to make their mark on the suburb long after the rush ended and the result is the bustling area of Little Italy, located on Lygon Street. Take a walk along the precinct and you’ll see hundreds of patrons feasting on pasta, pizza and other delights in the comfort of old buildings and al fresco dining areas. With many of these eateries passed down from generation to generation, it goes without saying that this is the best place to get Italian food! You can also buy beautifully crafted Italian goods, from fashion and accessories to Murano glassware and Ferrari –branded gifts. Little Italy also hosts the Carlton Italian Festa in October each year – no prizes for guessing why! Celebrate all things Italian during the festival, with live entertainment, cooking classes, a Vespa display and food, glorious food. Top it all off with a walk to nearby Piazza Italia, a joint project between Melbourne and its sister city Milan. The square features a giant sundial as well as many shaded seating areas to enjoy an antipasto picnic or delicious gelato. The Carlton Gardens is another famous garden, with perfectly manicured lawns and hundreds of colourful flowers framing it. It is also home to the Melbourne Museum, a modern, glass-faced building that is the largest museum in the Southern Hemisphere. Take the kids for a fun (and educational!) day out and learn about dinosaur fossils, Australian culture, the human body and tonnes more. Just opposite the museum is the postcard-perfect Royal Exhibition Building, which boasts eclectic, Renaissance-style architecture. One of the only manmade buildings in Australia to be listed as a World Heritage Site, it also hosted some events of the 1956 Summer Olympics. Longing for more entertainment? There’s no going past La Mama Theatre, a cosy, intimate theatre that’s called Carlton home since the 1960s. La Mama holds over 50 new Australian works each year and has given support and exposure to big names such as Cate Blanchett. Prefer movies over theatre? Cinema Nova is nearby and screens the latest and greatest arthouse films as well as selected commercial blockbusters. Just a 10 minute drive from the Melbourne CBD, this suburban haven is sure to surprise, delight and excite. Book your Carlton accommodation from our range below and don’t forget to pack your loose pants and an expanding belt! Need insider tips on must-see attractions in Carlton? 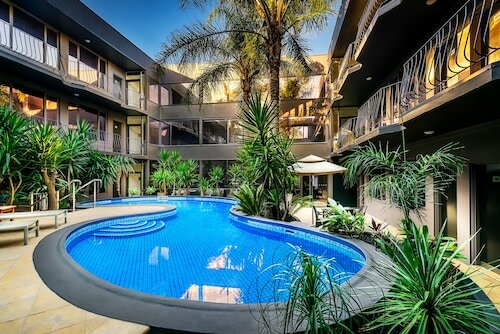 Check out our Carlton travel guide! How Much is a Hotel Room in Carlton? 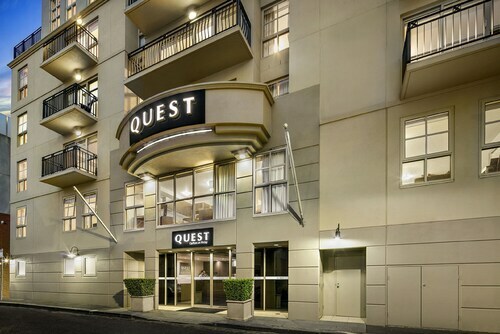 Hotels in Carlton start at AU$77 per night. Prices and availability subject to change. Additional terms may apply. Great location. Comfy bed. Clean. Noisy when the pizza bar across the road is pumping. Gaps around the doors and windows make it noisy and bright. Close to the shops and restaurants. Perfect spot not too far away from the CBD.